Watch live on NBC from 9 a.m. to noon. There'll be some monkeying around at the Macy's Thanksgiving Day Parade when Paul Frank's sock puppet-inspired simian Julius makes its debut in front of millions of spectators today. The helium heavies were inflated beginning at 3 p.m. Wednesday across the street from the western side of Central Park between 77th and 81 streets. Macy's parade also is expected to feature more than 40 other balloon creations, 27 floats, 800 clowns and 1,600 cheerleaders. Organizers say Neil Diamond, Mary J. Blige, Cee Lo Green, Avril Lavigne and the Muppets of Sesame Street will participate, some taking the stage at the end of the route in Herald Square and others performing on floats. The annual Thanksgiving parade is just a day away! Get a preview of the spectacle and prepare for 85th annual parade that airs on NBC at 9am, in all times zones, on Turkey Day. 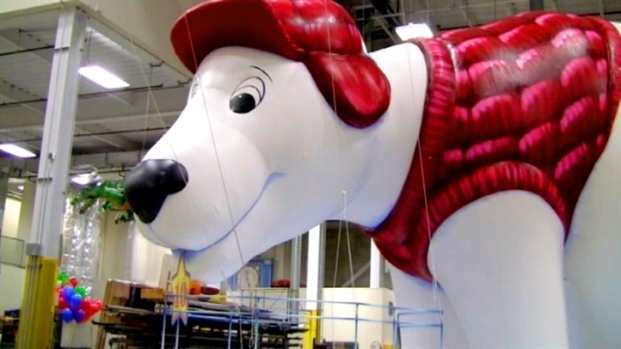 To see all about the Macy's parade by the numbers, go here. About 3.5 million people are expected to crowd the Manhattan parade route on Thursday, while an additional 50 million are watching from home. Parade spokeswoman Holly Thomas said officials were monitoring the weather. "The flight of our giant character balloons is based on real conditions about an hour before the parade begins and not advance forecasts," she said in an email. "There is no indication in any current weather models that the flight of these balloons will be affected." The parade got its start 87 years ago in 1924, and included live animals such as camels, goats and elephants. It was not until 1927 that the live animals were replaced by giant helium balloons. The parade was suspended from 1942 to 1944 because rubber and helium were needed for World War II. Since the beginning, the balloons — both large and smaller — have been based on popular cultural characters and holiday themes. Returning favorites this year include Buzz Lightyear, Clumsy Smurf, SpongeBob SquarePants and Kermit the Frog. Also making their first appearance at this year's parade are a pair of bike-powered balloons, one featuring a bulldog character, and an elf balloon designed by Queens resident Keith Lapinig, who won a nationwide contest. All of the balloons are created at Macy's Parade Studio, and each undergoes testing for flight patterns, aerodynamics, buoyancy and lift.